You are here: Home / Blog Post / Where does a wine auctioneer learn about champagne? 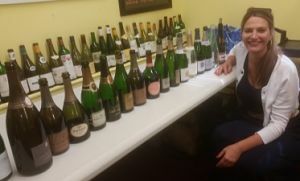 Where does a fundraising wine auctioneer go to learn about champagne? Drinking it often is a good start. But to more fully appreciate the bubbly, this past Monday (June 1, 2015) I headed to class. This just wasn’t any class. 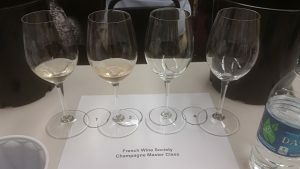 I went to the Champagne Master Workshop & Tutored Tasting organized by the French Wine Society. 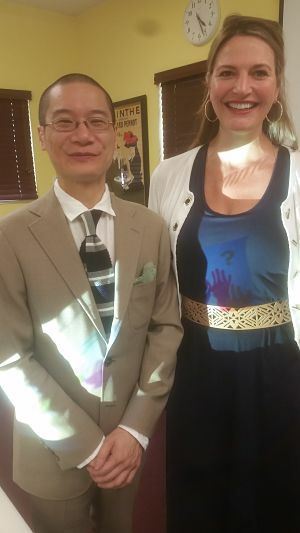 Peter Liem, one of the world’s experts on champagne, led the course. My brother is a huge fan of his and I can see why so many are eagerly awaiting Peter’s book. I’ve copy and pasted the course syllabus from the website below. For those of you with an interest, you’ll appreciate the ~20 examples of some pretty impressive bottles we worked through. The room was packed with 36 students from near and far. The man to my left worked for Krug and flew in from Miami; the woman to my right was a passionate wine student. 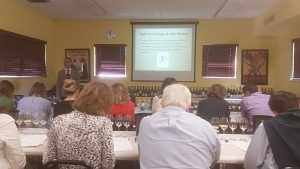 Peter Liem instructs champagne class in Washington, D.C. This 5-hour workshop, led by Champagne expert Peter Liem is designed for students enrolled in the French Wine Society’s Champagne Master-Level Program, but is perfect for anyone who wants to explore Champagne at the deepest level. Time to put theory to the taste test with an exemplary line-up of special wines! 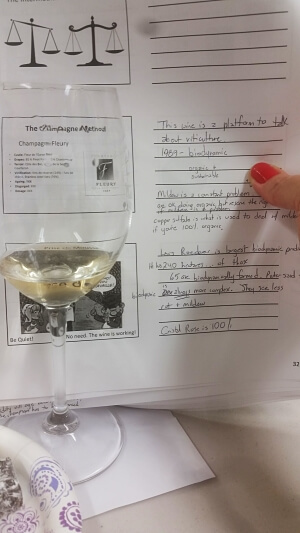 By working through nineteen still and sparkling examples, students will review the climate, soils, sub-regions and winemaking process of Champagne in an interactive format. Come prepared to sip, savor and discuss the factors that make champagne the most unique and distinctive sparkling wine on planet earth. The Champagne Master Workshop & Tutored Tasting will be structured around a series of champagne flights. Learn the AOCs…and review the climate that engenders this style of high acid wine. Taste Pinot Noir from Reims marl/chalk and Kimmeridgean marl; Pinot Meunier on clay and sandstone; Chardonnay on chalk and Pinot Blanc on Kimmeridgean marl. You’ll taste wines from old vine fruit and pre-phylloxera vines while discussing the sub-regions, terroirs and meso-climates of this diverse wine region. A look at most of the bottles we worked through in class. Review the champagne process while comparing and contrasting champagnes that do/do not undergo malo-lactic, that are/are not aged in wood…plus rosé made by adding Pinot Noir still wine vs. rosé de saignée. Hone your tasting technique and vocabulary by examining the structures and aromatic profiles of vintage champagne made during a classic year, a warm year and a cool year. What defines an age-worthy wine? How do vintage champagnes differ from NV bottlings? Explore the sensory impact of a demi-sec champagne and pound cake vs the same dessert and the same wine decanted! Sample champagne’s huge side industry: marc de champagne truffles. Review key points of study with an interactively sweet finish to the day. One of my strengths as a benefit auctioneer has always been that I know what I’m selling. If the bidding stalls … even if the item is as simplistic as dinner with the Headmaster … I want to have a back-up anecdote or two to re-ignite bidding. It might be a quick comment about how the Headmaster is an entertaining story-teller, or that his wife makes a killer martini. The point is, I want to know my merchandise. The same principle is true for me when selling wine (or specifically, champagne in this case) at auction. Though I had tried a number of these bottles prior to class and had some basic background (e.g. how many times on stage have I mentioned that Pol Roger was Winston Churchill’s favorite champagne? ), I wanted to have more ammunition to be able to secure that extra bid or two when working at a wine auction. I invest in me, so my clients will invest in me. It’s hard work! You ever tried keeping 20 champagnes straight? P.S. Want to see me work a benefit auction room? Check out the video on this page.